People always say "write what you know." If you're not writing what you know, research, research, research. I've been reading comics since I was a kid, and I've always loved superheroes. I lived in (actually still live in) what is known as "the hood." I can remember running away from gunshots when I was six. So I always felt like I needed superheroes in my neighborhood. Wait, I'm getting off track here. I'll get more into that one day soon :-). My point is, I know about superheroes and comics, but I still do research as I write this book. Here are a couple of resources that are helping me along the way. "Shouldn't all dictionaries start with AAAA and end with ZZZZZZZTZZZTZZZ? Ka-BOOM! does: it's a collection of sound effects from comic books, each one rigorously defined and cross referenced. 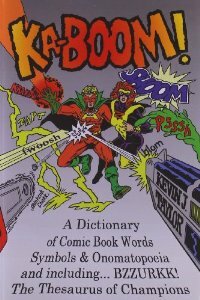 Nowhere has the art of onomatopoeia been raised to higher heights than in the humble comic book." This book is a gem for writing action scenes. I like to include onomatopoeia's in my fight/action scenes just to give it a feel of a comic. This book is awesome for that. Need to know the sound of Spiderman swinging from his web cord? It's in this dictionary. The book is available at Amazon here. The Superpower Wiki: The wikipedia of superpowers. This site is amazing. Seriously, ah-maz-ing. It lists superpowers under various categories including mimicry, mental powers, enhancements, etc. There's not a superpower that isn't listed on this site. The wiki provides the various names of powers, the capabilities, applications, techniques, variations, levels, associations, limitations, and the known users. So, if you're unfamiliar with a certain superpower, check it out here. This is just an overall great resource for writing superhero books. There are tips on there that can be applied to non-superhero books too. Well, that's all I can think of for now. Off to do some writing and revising.